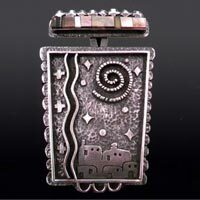 The mission of the Native Jewelers Society is to allow metalsmiths to share experiences and to encourage artistic, innovative creations; we are committed to maintaining high quality work with integrity and honesty while preserving the indigenous cultures that we come from; and to improve educational opportunities for fellow metalsmiths. What is Native Jewelers Society? Native Jewelers Society is a group of Jewelers who will interact with one another and share information that will benefit everyone in the group. I envision the group helping the up-and-comers, the youth, the elders, and each other. I would like to see the group help our Native community as well, e.i. Workshops for youth and community, Toys for tots, food drives, fire wood for elders, etc . The group will interact with supporters of the Native Jewelry world, e.i., galleries, collectors, stone dealers, authors and other publications, museums, and many others. The group members will also showcase their works of art on the NJS website. It's gonna be a family thing. Many will not join but that is okay, because we all have something in common with Native Jewelers Society and that is unity.